Home / Unlabelled / HOW SHOULD ALLAH’S NAMES AFFECT OUR LIVES? 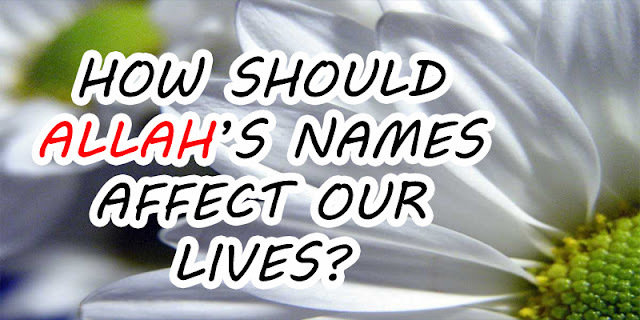 HOW SHOULD ALLAH’S NAMES AFFECT OUR LIVES? We know that Allah has many beautiful names and attributes, and some of us even memorize His 99 names in order to attain paradise. In reality, how much do we know about God’s names, and how do they affect our lives? Just memorizing a bunch of words is no use if they don’t really have any impact in our lives. So let us look at some of Allah’s beautiful names and how they influence us if we really grasp their meaning. Remembering Ar Rafeeq will have the effect of making us gentle and kind to others all the time, hoping that Allah will deal with us gently and not harshly despite our sins. Remembering Ar Raqeeb will instill in us the fear of Allah. We will become aware of Allah and the fact that He is watching whatever we’re doing, making us abandon doing things that displease Him. Remembering Al Maalik will make us aware of the fact that our belongings don’t really belong to us. It will prevent us from being a ‘my’ person – my room, my car, my house, my clothes etc. It will prevent us from being over possessive and greedy, and instill in us a generous, open personality. Remembering Ar Rahman will make us patient, content, happy and hopeful despite troubles in our lives. We will know that no matter what happens, Allah is there protecting us all the time just like a baby is protected inside its mother’s womb (called rahm in Arabic). It will also make us merciful towards others, hoping that Allah will show mercy to us. Anyone else who claims kibriya’ is in reality trying to compete with Allah, which is impossible to accomplish ever. Therefore, remembering al Mutakabbir reminds us of our lowliness and humbleness in front of Allah. It also reminds us that all human beings are the same in status. No one is greater or smaller than any other human being. We are all equal, except in taqwa.